Chinese wood-block print of the world. By Lü Weifan in 1722. This map isn't part of any series, but we have other maps tagged 'astronomy' that you might want to check out. If anyone can help identify this amazing map, I'd appreciate it. Wood block print. Relief shown pictorially. Primary coverage includes maps of China and the world, and astronomical map of the polar regions (northern and southern hemispheres). 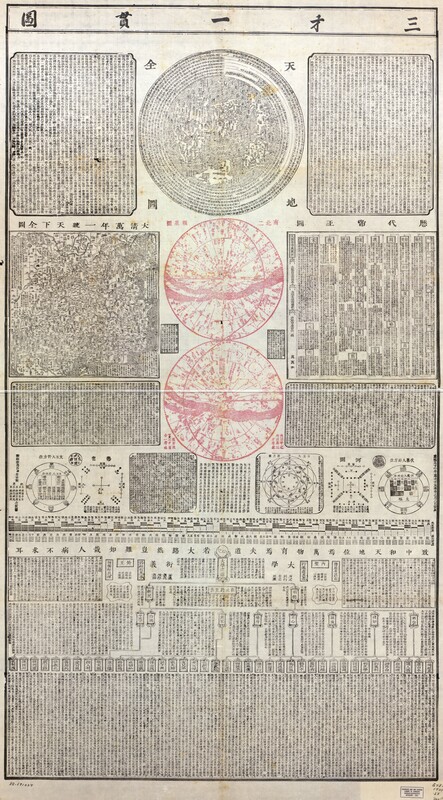 Includes chronological table of Chinese history (the dynasties), charts of the 8 phenomena, maps of the planets and their orbits, excerpts of Chinese classic literature (Daxue), etc., and other writings. Da Qing wan nian yi tong tian xia quan tu -- Tian di quan tu -- Nan bei liang ji xing tu. It also claims that it is from Shaoxing [gmap]. I have a print of this: it’s stunning. I love this! The chart has a dynastic family chart on the right (think family trees of emperors), and on the left center is an actual physical map of the territory of China held at that time (Qing dynasty I think, so about 1700- 1800 here. )I think the world map as a whole is depicted in center map. Astrological charts and positions are in there, but I cannot make out meaning (time and space locations?) I cannot translate, but it is amazing and wonderful find. Thanks for posting! 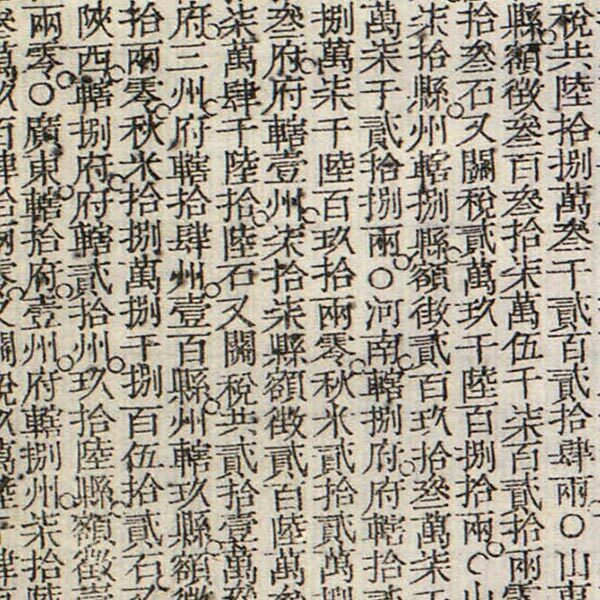 This is the “Sancai Yiguan Tu”, a rough translation being “The Three Talents/Abilities in a Single Chart”, most likely by Qing dynasty scholar Lv Fu, which fits with the supposed date of 1722. The three talents/abilities are heaven, earth and man. The top image at center is a map of the world, complete with the Americas. The US is marked as the “13 states”. Below are two maps of the heavens, flanked by a list of all Chinese dynasties and emperors at right, and a map of the Qing empire at left. Below is a treatise on natural phenomena. I believe the chart is some kind of calendar. The wall of text at the bottom is a treatise on human affairs. I’d go into more detail, but I have to get back to work and I’m not much of an authority on ancient Chinese. Thanks so much for your tremendous help in translating and clarifying the chart. I’m always amazed by and indebted to the diverse expertise of the readers of the Blog. If you ever have anything else to share on this map (or on the other Chinese maps) I would love to hear it.